Almost half of all immigrants seeking assistance have a valid legal claim or available legal avenue to obtain legal status in the US. However, immigration laws and related legal proceedings are complex. To make a legal right a reality, low-income immigrants need help to successfully access and navigate our justice system. We provide expert legal services so that low-income immigrants can overcome barriers and access justice. Unaware of their rights and overwhelmed by a complex legal bureaucracy and language barriers, many immigrants require the aid of a professional to navigate the U.S. immigration system. Ayuda’s staff attorneys and pro bono program serve more than 2,000 women, men, and children every year by helping them obtain visas, work authorization, legal status, and more. Adjustments of status to permanent residence, naturalization (citizenship), Temporary Protected Status, work authorization, and Deferred Action for Childhood Arrivals (DACA). 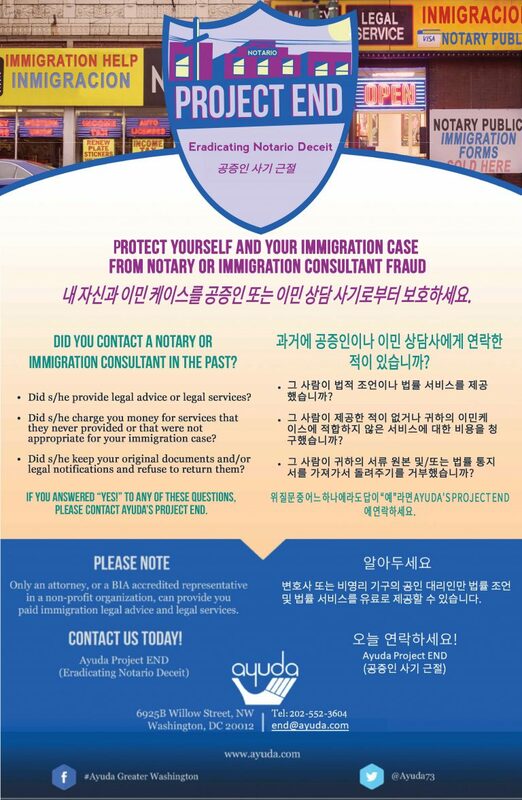 Need help with an immigration matter? The first step toward a solution is to come in for a consultation with one of our staff. Please contact one of our offices to schedule a legal consultation. The cost for a consultation is $100. Pay special attention to the different service hours between the offices in DC and Virginia. Consultations are held every Thursday morning and require an appointment. To make an appointment, please call, beginning at 9 a.m., on the 15th of the month (or the next business day if the 15th falls on a weekend, a holiday, or weather-related closing). For example, appointments for April are scheduled starting March 15. Consultations are held every Tuesday morning and require an appointment. To make an appointment, please call, beginning at 8 a.m., on the 15th of the month (or the next business day if the 15th falls on a weekend or a holiday). The first step toward a solution is to come in for a screening with one of our Domestic Violence and Sexual Assault Program staff members. For Appointment Hours or for more information, please call (202) 387-4848. If you have tried to get help from the wrong in people in the past, we can help. Project END (Eradicating Notario Deceit) is a direct legal services project aimed at remedying the harm caused by notario or immigration consultant fraud. Project END provides advice, counsel, and representation to victims in civil, criminal, and immigration proceedings. A notario, notario público, or immigration consultant in the U.S. is not an attorney nor an accredited representative of the Department of Justice in the U.S., and consequently, is not licensed to provide paid immigration legal advice or legal services. Unscrupulous notarios or consultants routinely prey on immigrants who, because of linguistic, cultural, and financial obstacles, believe a notario or consultant can assist them with their legal issues. The fraudulent work of notarios or immigration consultants can have life-devastating consequences on its victims, including financial ruin, damage to a legal case, deportation, and permanent family separation. 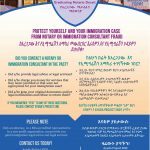 If you have any questions or would like to refer a case to Ayuda’s Project END, please contact Ambar Martin, Immigration & Project END Legal Assistant, at ambar@ayuda.com | 202-552-3619. 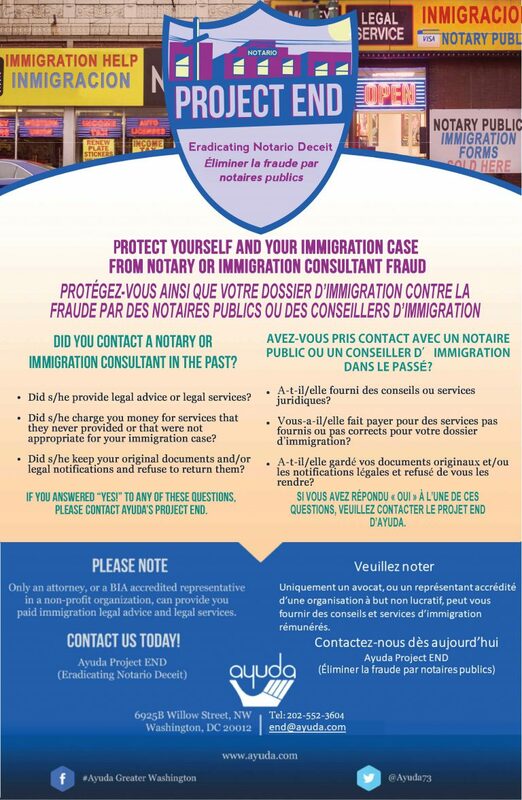 View Ayuda’s immigration services fraud prevention videos here. View Ayuda’s immigration services fraud prevention memes here. Ayuda’s Project END encourages consumers to submit complaints to the Federal Trade Commission (FTC). Complaints are viewed by local and national law enforcement and government agencies to identify and take action against businesses or individuals who defraud immigrant consumers. To submit a complaint, please visit: FTC Complaint Assistant and click “Other” then “Immigration or Tax Services.” Complaints may be submitted anonymously. Ayuda Project END has created a guide to show how to submit notario/legal services fraud complaints in DC, MD, VA, and nationally, with a summary of the potentially relevant civil and criminal statutes in each jurisdiction. Ayuda partnered with Georgetown University Law Center’s Community Justice Project to develop resources on the options for accessing justice afforded to victims of notario fraud in the Washington, DC, area. Protect and Serve: Access to Justice for Victims of Notario Fraud in the Nation’s Capital, provides a legal assessment of the problem of notario fraud, explains the adverse impacts, outlines various remedies available to victims, and offers recommendations for how to effectively bring justice against perpetrators. Notario Fraud Remedies: A Practical Manual for Immigration Practitioners offers tools to identify notario fraud, to interview victims, and to advocate for immigration remedies, including Prosecutorial Discretion, U Nonimmigrant Status (for crime victims), and Motions to Reopen due to Ineffective Assistance of Counsel. Project END is funded by the D.C. Bar Foundation and other donors.